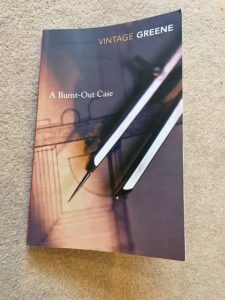 This entry was posted in English Literature and tagged A Burnt-out Case, Graham Greene, Vintage Classics by Simon Lavery. Bookmark the permalink. This is one of the Graham Greene novels that I haven’t read, and I thought from your description of it that perhaps it came very late in his career, but Wikipedia tells me that he was still writing in 1990 just before he died. In fact he went on to write some very good novels afterwards, so maybe this one is an aberration for some reason? Not one of his that I’ve read and it sounds like I haven’t missed much. I haven’t read this Greene either, but I have read a lot of others, and the one I struggled with most, oddly, is The End of the Affair. It was the endless religious soul searching which troubled me most, and I find I often enjoy those he labelled as entertainments more. However, I found his entertainments are often surprisingly deep and thought-provoking. It may just be me misreading him, or perhaps he gets his point across better when he makes it easier to digest.